Pedestrian Injuries : Farrow & Pulice, P.A. 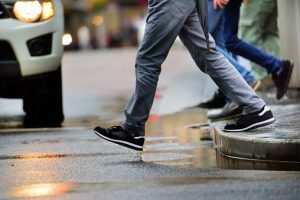 Injury lawyers in Bradenton and throughout Florida continue to see far too many serious and fatal pedestrian accidents. A recent column featured by DriveitHOME™, an initiative of the National Safety Council, highlighted crosswalk dangers for pedestrians. In conducting his own night-research, the columnist was shocked at how many drivers were immersed in the electronic glow of their smartphones. While the risks of distracted driving are well documented, no group is at greater risk than pedestrians. Even when using crosswalks, pedestrians were at increased risk of a serious or fatal accident due to drivers succumbing to the lure of electronic devices. Nowhere in America are the risks higher than right here in the Sunshine State. Allowing right turns on red and legal U-turns both increase the risk to pedestrians and both are commonplace in Florida. Florida's large population of older adults also faces increased risks. AARP recently reported those over the age of 65 are 50 percent more likely to be struck down while walking. SmartGrowth America reports 8 of the 10 most dangerous cities in America for pedestrians are located in Florida. North Port-Sarasota-Bradenton was the nation's 10th deadliest city for walkers. SmartGrowth estimates many of these accidents could be prevented by more intelligent urban design, like better sidewalks and streetlights. But unfortunately Florida has largely focused on building roads for passenger vehicles, at the expense of bicyclists and pedestrians. Unfortunately, a large number of serious and fatal pedestrian accidents are caused by hit-and-run drivers. Just last month, Tampa Bay Times reported a pedestrian was killed by a driver who fled the scene. In February, the Florida Highway Patrol launched a "Stay at the Scene" awareness campaign in response to the large number of hit-and-run pedestrian accidents in Southwest Florida so far this year. Florida auto insurance law requires a minimum of just $10,000 personal injury protection (PIP) coverage and $10,000 property damage liability (PDL) coverage. Florida law does not require motorists to carry uninsured motorist (UM) or underinsured motorist (UIM) coverage. However, such coverage is invaluable. In the event of a pedestrian accident involving a hit-and-run driver, a victim's own UM/UIM policy can pay damages. PIP coverage is meant to pay for a victim's medical expenses, regardless of fault, in the immediate aftermath of an accident. However, lawmakers have restricted coverage in many cases to just $2,500 under pressure from insurance lobbyists. Always use the sidewalk. Walking against traffic when no sidewalks are present will allow you to maintain eye contact with oncoming traffic. Always cross at corners and crosswalks, where pedestrians are expected. Pedestrians crossing mid-block should yield the right of way to motorists. Never enter the street between two parked cars. Wear bright or reflective clothing and carry a flashlight when walking at night. Pay attention. Avoid using headphones, cell phones or other distractive devices. Obey pedestrian signs and signals. In some cases, a pedestrian may be unfairly blamed for an accident. This is particularly true when an accident occurs at night and also sometimes when a pedestrian is killed, and thus unable to defend himself. Consulting an experienced Bradenton injury attorney is best done as soon as possible after an accident, as determining fault and liability can be critical to a victim's ability to collect damages.